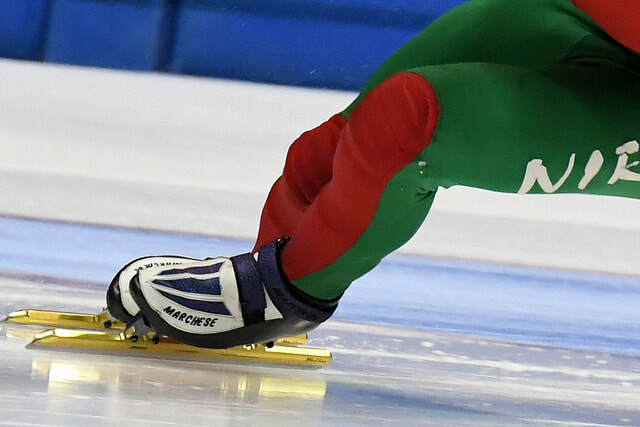 You've watched the British short track speed skating team at the Olympic games and you've thought I want to be the next Elise Christie or Josh Cheetham. Well you can! Come along and give it a try, with us at the Nottingham Ice Racing club (NIRC), in the National Ice Centre. Anyone can try it out from 5 years old to over 55. See if you can get up to 30 mile per hour on a 1 millimeter thick blade (maybe not at first)! If you can skate already, why not come and watch our club session on a Saturday (from 08:30 am to 09:30 am) , have a chat with members and join the fun, or contact us at nottmirc@hotmail.co.uk for more information. There is also more information see the Club pages. See what equipment you will need on the "New to Skating" page under "What do I need?" See here more about the sport; how the races are run, the rules and the equipment used. If you need a basic skating course try out the SkateUK first. You will be following if the blades of NIRC's own Olympian's.